In a recent discussion about the extent to which Demand Charges are an impediment to development of DC fast chargers EV Fast Charging Disincentives, the solutions explored included primarily a) regulatory reform of the rate design & b) technology solutions involving battery based peak shaving. 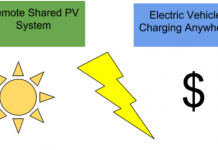 A 3rd solution could be added, for strategies involving charging with behind-the-meter renewable generation. Solar carports can offer such a solution, with various configurations involving batteries sized to support L2 chargers. Most of the PV carports are grid-connected but can be islanded. I recently discovered a system that is completely off-grid. So far most of the carports I had seen were intended to provide power to buildings, with EVSE’s an incidental feature, and few if any carports PV systems were sized with sufficient battery capacity to support DC chargers at or above 50kW. 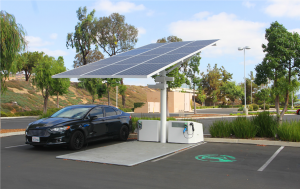 EnvisionSolar (OTC QB: EVSI) has developed two versions of an off-grid PV carport with storage and EVSE, one which is anchored to the parking surface, their “Solar Tree®”, and can provide power to a DCFC EVSE. The other is a stand- alone “portable” variant, their “EV ARC™”, which powers a Level2 EVSE. 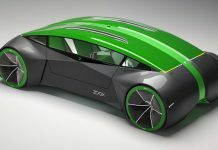 Both incorporate tracking technology to enhance generation up to 25%. 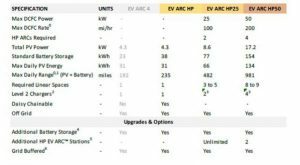 The EV ARC™ battery specs indicate capacity of 24kWh up to 40kWh, providing up to 225 miles of charge with Level 2 EVSE’s. 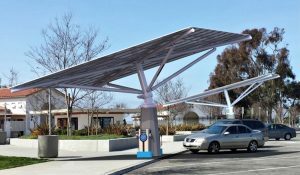 The Solar Tree® canopy can deliver 700 miles of charge, with DC fast chargers at 50kW. 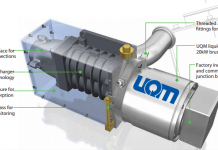 A system using an upgraded high power version of the EV ARC™HP can be daisy chained in series, with 2-4 units to provide DC fast charging at of 25kW, up to 50kW, which would translate to 981 miles of range. Envision advised that this variant is being implemented for a municipality for charging electric buses, which can both stand alone as off-grid but can be “grid-buffered”, much like “microgrid islanding”. utility charges for transformers and, if the project is scaled large enough, for installation of a substation. But additional balance of system costs may offset some of these savings, primarily due to costs for the PV canopy structure and batteries in particular. Factoring in these additions and subtractions, how would the net costs of delivered electricity compare with volumetric power drawn from the grid at optimized Time of Use rates, using Level 2 EVSE’s? In reviewing a schedule of cost estimates, it was found that there was an estimated advantage of almost 25% lower average cost of ownership for an “EV ARC” compared to a grid-connected L2 EVSE, the largest component being the avoided cost of electricity (over a 10yr period). 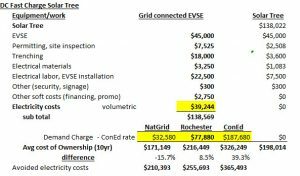 However, 10-year costs of ownership for the Envision Solar Tree compared to a grid-connected DCFC, were complicated by a range of values for avoided Demand Charges. 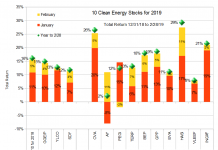 Plugging the values for 10 year costs calculated from the rates from the utilities with the lowest, highest & approximately median Demand Charges into the projections, the 10yr Cost of Ownership estimate as shows the maximum net reduction of 39%. To the extent that Envision’s siting model is aimed at maximizing avoidance of Demand Charges, the prime targets would have to be in the utility load zones with the highest charges. 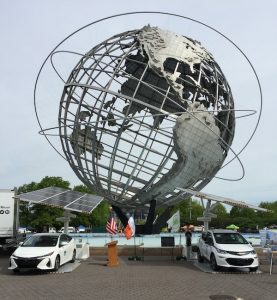 Accordingly, Envision reported a contract for 30 EV ARC units which were deployed on several Long Island sites, with expectation of another 50. Feasibility of the off-grid model being pursued by Envision Solar depends in part on cost advantages, but also in part on its ability to site more flexibly. To the extent that their business model is not focused solely on opportunities to avoid Demand Charges, it appears that the marketing focus is on portability, ability to install quickly, and to relocate, which enhances their use as emergency power supplies. If their initial capex costs come down faster than grid-connected DCFC strategies, this off-grid approach may gain more market share, especially if the longer high avoided Demand Charges remain in place. 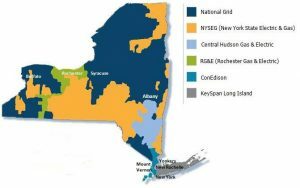 However, they may soon be waived or mitigated, pursuant to a recommendation3 filed with the NY Public Service Commission by the NY Dept of Environmental Conservation (DEC) and NY Power Authority (NYPA), contending that Demand Charges render the business case for privately capitalized DCFCs infeasible, and that a revenue model based only on volumetric electric costs is needed to incentivize privately capitalized development of DCFCs. The DEC also offers grants for 80% of DCFC development, including both EVSEs, site development & soft costs, up to a max of $150,000 per dual station, structured to benefit both municipalities and commercial entities partnering with municipal & county agencies. In a recent interview with ChargePoint CEO in Bloomberg New Energy Finance, it is noted that as of the end of 2017 there were approximately 68,000 charging outlets. 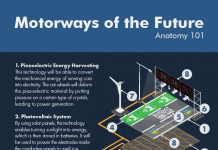 Expansion of charging infrastructure is expected to double in the next 2-3 years. DC fast charge stations will need to be available at intervals of 75 miles to meet range concerns on long haul corridors. Tesla’s charging network expansion is approaching that goal, but for non-Tesla drivers, there is a shortage of DCFC stations, which will likely be met by independents like ChargePoint, VW-funded ElectrifyAmerica, and others. Further, DCFC installations for passenger vehicles will not likely be limited to long haul corridors. In additional to DCFC’s for commercial industrial users, such as delivery truck fleets and bus fleets, more availability for “pit stops” of 15-30min to top up to 80% will also likely boost market penetration of BEVs. Although the gas station paradigm for siting EV charging is being eclipsed in favor of co-location with dining, shopping and hospitality, there are an increasing number of oil company operators of large gas station chains acquiring EV charging assets. This is due in part because gas stations have already mutated into enterprises that feature convenience stores which generate a greater percentage of net earnings than gas sales. 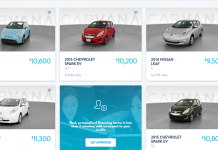 Ample, a startup raised $31 million Series A funding from oil concerns Shell Ventures & Repsol. AEC, which operates small hydro plants in upstate NY, was pursuing an agreement under a remote net-metering arrangement to install 100 DCFCs at sites owned by Stewarts, an independent chain in NY of gas station/ convenience stores. FastNed in Germany Holland is a charging enterprise backed by utilities & EV manufacturers, constructing gas station-style stops that will soon incorporate PV, batteries, demand & frequency response capabilities. Although the model for “charging centers” is currently being redefined, as discussed in this CleanTechnica article, it remains likely that EV charging may continue to be developed within the context of a modified gas station model. The prospect of off-grid charging in a gas station style has become increasingly likely as a strategy in the campaign to accelerate the overall goal of expanding charging infrastructure. Previous articleCan Amyris Find The Ingredients Of Success?